Full of remarkable anecdotes, illustrious characters, and personal musings ("I still maintain that rock 'n' roll should be self-taught")—and interspersed with Dickinson's poetry—this posthumous autobiography reads as a Who's Who in the Memphis and greater southern music scenes. His take on southern music will prove to be an important document for those who study the genre's history. Jim, by the way, was the founder and leader of the Yalobushwackers (Thacker Mountain Radio's house band) for a number of years. Please join us April 6th for an event with Dickinson's widow, Mary Lindsay Dickinson. 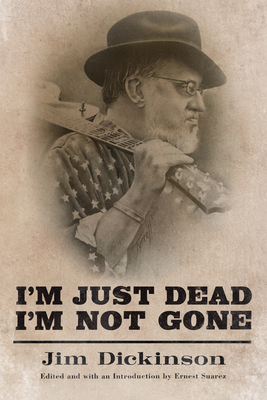 I'm Just Dead, I'm Not Gone chronicles Jim Dickinson's extraordinary life in the Memphis music scene of the fifties and sixties and how he went on to play with and produce a rich array of artists, including Aretha Franklin, the Rolling Stones, Ry Cooder, Duane Allman, Arlo Guthrie, and Albert King. With verve and wit, Dickinson (1941-2009) describes his trip to Blind Lemon's grave on the Texas flatlands as a college student and how that encounter inspired his return to Memphis. Back home, he looked up Gus Cannon and Furry Lewis, began staging plays, cofounded what would become the annual Memphis Blues Festival, and started recording. The blues, Elvis, and early rock 'n' roll compelled Dickinson to reject racial barriers and spurred his contributions to the Memphis music and experimental art scene. He explains how the family yardman, WDIA, Dewey Phillips, Furry Lewis, Will Shade, and Howlin' Wolf shaped him and recounts how he went on to learn his craft at Sun, Ardent, American, Muscle Shoals, and Criteria studios from master producers Sam Phillips, John Fry, Chips Moman, and Jerry Wexler. Dickinson is a member of the Mississippi Music Hall of Fame and an inaugural inductee of the Memphis Music Hall of Fame. He has received the Lifetime Achievement Award for Engineering and Production from the Americana Music Association, a Brass Note on the Beale Street Walk of Fame in Memphis, and a Heritage Marker on the Mississippi Blues Trail. This memoir recounts a love affair with Memphis, the blues, and rock 'n' roll through Dickinson's captivating blend of intelligence, humor, and candor.